This database contains comprehensive information on Most-Favoured-Nation (MFN) applied and bound tariffs at different levels of the standard Harmonized System (HS) for all WTO Members. It also contains non-MFN applied tariff regimes at the HS subheading level. This information is sourced from submissions made to the WTO Integrated Data Base (IDB) for applied tariffs and imports and from the Consolidated Tariff Schedules (CTS) database for the bound duties of all WTO Members. From the welcome page click on Next >> at the bottom right hand corner after the introductory text. The next page allows for the selection of reporters (import markets) and products. The last page allows for the downloading of the data retrieved from the database according to the products and reporters specified in the selection. The two panels Reporters and Products each come with a collapsible editing area, which allows for selecting or deselecting items, and an area at the bottom showing the current selection. To hide the editing area of the panel click on the button in the right corner of the panel header. To reopen it click on the same button. This upper panel of the Reporter and Product selection page displays all reporters with applied tariffs and/or bound tariffs in the database. To select a reporter, click on the empty check box next to each reporter name on the list. A ü (check mark) appears beside each chosen reporter. The reporter names are listed alphabetically. The scroll bar is on the right of the Reporter selection box. You can choose one or several reporters. To deselect a previously selected reporter, click on the reporter check box again and the ü disappears. To choose all reporters, click on Select all on the upper right corner of the Reporter selection box. Note: If you choose this option it can take considerable time to get the downloaded data, especially if you select many products. For the maximum number of records see the Download Limit. To clear all current reporter selection, click on Deselect all on the upper right corner of the Reporter selection box. By default, the latest three available years for applied duty with the bound duty data are included for the reporter/s selected. The latest three available years for applied tariffs can vary across reporters. To see the applied data time series available for each reporter selected, click on the + sign to the left of the reporter name. The list of years will be displayed. The user can select the year/s from this list. The +/- sign toggles between displaying list of years or hiding the list. The current selection appears on the lower portion of the Reporter selection panel. For each reporter selected, the available year/s of applied tariff information, nomenclatures of the original data as submitted by the reporter corresponding to the year/s selected and whether or not there are bound tariffs are displayed. Additionally, the last line shows all nomenclatures used in the current selection. The display of the current selection changes dynamically as the user varies the selection. In the example below the system will retrieve the following data: Australia applied tariffs for 2007 and bound tariffs. The nomenclatures corresponding to the data selection subset are HS 1996 for the bound tariffs and HS 2007 for the applied tariffs. To restrict the data shown in the editing area click on the Filter box in the upper left corner of the Reporter selection panel. The Filter Criteria screen below will be displayed. 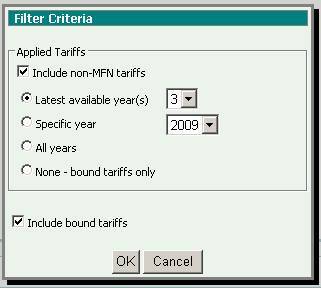 The Filter option allows the user to choose either of the following criteria for applied tariffs: (1) the latest available n year(s) where n is from 1 to 5 years; (2) a specific year from 1996 to the latest available year; (3) all years; and (4) None which means no applied tariffs are desired, i.e., user is only interested in bound tariffs. There are additional options in the filter dialog box – Include non-MFN tariffs and Include bound tariffs. By default these options are checked, which means all non-MFN applied tariffs for the selected reporter/s and year/s and bound tariffs for the selected reporter/s are included in the download. These boxes can be checked or unchecked separately to either include or exclude the corresponding data in the download file. When the selection for Applied Tariffs above is set to None, the option Include bound tariffs should remain checked, otherwise the filter setting is disregarded. Any selection on Applied Tariffs would ALWAYS include MFN tariffs. After clicking on OK, the filter criteria are displayed alongside the Filter button and the editing area of the reporter selection is updated accordingly. Note 1: Applying the Filter option clears any previous reporter selection. Note 2: The list of reporters displayed in the Reporter selection panel depends on the Filter criterion selected. For example, if the selection is for 2009 applied tariffs and the option to include bound tariffs is unchecked, only the reporters who have data for 2009 would be listed. However, if the Include bound tariffs option is checked, all reporters who have 2009 applied tariffs and who have data on bound tariffs (i.e., all WTO members) would appear in the Reporter selection list. The currently active Filter options are displayed next to the Filter button in the Reporters panel. The next panel called Products allows product selection. The initial display of this panel is the list of the 97 chapters of the Harmonized System (HS) nomenclature. The scroll bar is on the right side of the editing area. There is a dropdown list where the user can select either all products (the default), the WTO definition of agricultural products (AG) or the WTO definition of non-agricultural products. To select any HS chapter, click on the corresponding empty check box on the left. All HS 6-digit subheadings of the selected chapter would be included. To refine the selection based on a more detailed degree of disaggregation, i.e., heading (HS 4-digit) and subheading (HS 6-digit), click on the + sign. The +/- sign toggles between displaying the next level of disaggregation or compressing the display to the next higher level of aggregation. The system will give data only at the HS 6-digit level regardless of the level of disaggregation in the product selection. To choose the whole nomenclature, click on Select all on the upper right corner of the Product selection box. Note: If you choose this option it can take considerable time to get the downloaded data, especially if you select many reporters/years. For the maximum number of rows see Download Limit. To clear all current product selection, click on Deselect all on the upper right corner of the Product selection box. To reset the product selection to its initial state click the Clear Button. The list of products selected appear on the lower portion of the Product selection box. This display changes dynamically as the user varies the selection. In the example below, the products chosen are HS Chapters 02 and 03, i.e. all subheadings for these two chapters. After the selection for Reporters and Products has been completed click on the NEXT>> button either on the upper right of the Reporters panel or the lower right of the Products panel. To search for a specific product based on the standard HS description, use the search facility. Enter the word(s) in the empty box in the top middle part of the products selection panel. The system will return all subheadings that include the text search criterion either at the subheading level or at the higher corresponding level (4-digit heading or chapter level). In the example below, the search result for the product 'tomato' includes subheading code "200290 – Other" because the standard definition of the HS 4-digit heading code "2002" is "Tomatoes prepared or preserved otherwise than by vinegar or acetic acid." Note 1: Searching for a product or pressing the button Clear clears any previous product selection. Note 2. The search looks for the string criterion from the standard descriptions of the product classification corresponding to the nomenclature displayed. A word or text string might not exist in one nomenclature but might be present in another. For example, if you search for the text string 'smart card', you would not get any corresponding code if you use the default nomenclature which is HS 2002 but changing the nomenclature to HS 2007 would return seven subheading codes related to the product 'smart cards'. Note 3: As mentioned earlier, the search looks for the text string in the standard description associated with a specific nomenclature. In some cases results can be unexpected. If you enter 'wine' in the search box it will find 'wine', but also 'twine' and 'swine'. In such cases you may get a better result adding a blank at the beginning and/or the end of the search term. In the example the search text ' wine' (with a leading blank) will not return 'twine' or 'swine'. The database stores the information in the original nomenclature in which the reporter made its applied tariff and imports submission for any specific year. For bound tariffs, the data are stored in the original nomenclature of the WTO accession document or in the latest nomenclature available in the Consolidated Tariff Schedules database. The application, however, allows you to select products in a different nomenclature. To do this, click on the nomenclature selection box below the title line of the Product selection panel. The standard nomenclatures will be displayed. Changing the nomenclature will update the editing area of the product selection accordingly. Only one nomenclature can be chosen from the list. The default nomenclature for product selection is HS02. While the initial display of the Product selection panel contains the list of HS chapters which is consistent across all HS revisions (chapters 01 to 97), the product breakdowns at the HS 4-digit heading and HS 6-digit subheading levels will be based on the nomenclature indicated and these vary for each HS version. As previously mentioned the HS 6-digit subheading is the most detailed level of the standard disaggregation of the HS nomenclature. Note: Changing the nomenclature clears any previous product selection. When the selection criteria correspond to data in different HS nomenclatures, the application uses the standard concordance table between the original nomenclature of the tariff data for the selected year(s) and the user-selected nomenclature. The output file contains the subheadings in the original submission nomenclature corresponding to the subheadings in the nomenclature selected by the user. A concordance or correlation table is provided for all those subheadings where there are changes between the original nomenclature and the user-selected nomenclature. In the example above, the user selects Australia applied tariffs 2007 which are in HS 2007 nomenclature and bound tariffs which are in the HS 1996 nomenclature. If the user does not change the default nomenclature which is HS 2002, the HS_Concordance table will show all subheadings with changes between HS 1996 and HS 2002 and all subheadings with changes between HS 2002 and HS 2007. If the user changes the nomenclature to either HS 1996 or HS 2007, the HS_Concordance table will show only subheadings with changes between HS 1996 and HS 2007. See also Product Selection. After data retrieval the download page shows the record count of the observations extracted from the database corresponding to the reporter/year and product selection and other filter options and allows the download of the data in several formats. The information on record count refers only to those for tariff data, i.e., MFN applied, non-MFN and bound tariffs. The record count for other information available like non-MFN-only partners and HS concordance is not displayed. The data are downloaded in a zip file named DATAEXPORTnnnnnn.zip where nnnnnn is the timestamp. 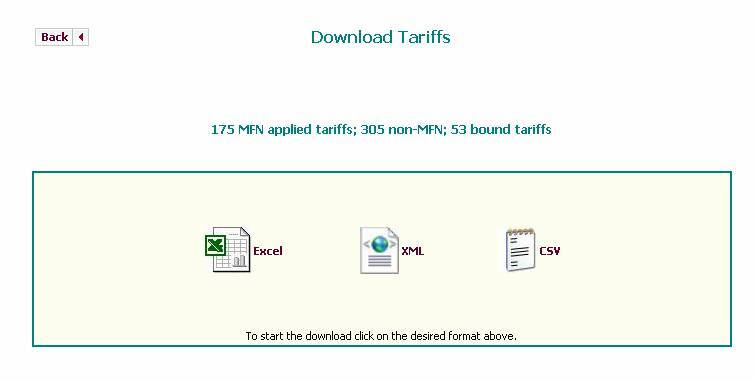 The Download Tariffs page allows the user to choose the download format of the data: MS Excel, XML (Extensible Markup Language), or CSV (Comma-Separated Values). For downloads in EXCEL format, the header cells with a red upper right corner tab have labels that give a short technical definition of the corresponding column. Depending on the information chosen for download, there can possibly be five worksheets in the EXCEL file – Applied_MFN for MFN applied tariffs, Applied_NonMFN for non-MFN tariffs, NonMFN_Only_Partners for the list of export partners entitled to duties other than the MFN tariffs and the different tariff regimes granted to them by the reporter country, Bound for bound tariffs and HS_Concordance (see Information regarding changes in Nomenclature), if applicable. Similarly, there can be five XML files or five CSV files, with the same corresponding names. For easy comparison of MFN and non-MFN applied tariffs, the first thirteen columns in the sheets/files Applied_MFN and Applied_NonMFN are common. These columns contain the identification variables and the tariff indicators. It should be noted that the data included on Applied_NonMFN are only those subheadings where the duty is different from the MFN (i.e., average AV non-MFN duty is the same as average AV MFN duty and number of national tariff lines with duty different from MFN (col(14)) is zero). Statistics on bound tariffs in col(5) to col(12) of the sheet/file Bound correspond to the same statistics on applied tariffs in col(6) to col(13) of the sheets Applied_MFN and Applied_NonMFN. The worksheet/file NonMFN_Only_Partners list does not include partners which are only granted MFN duties by the reporter for the specific year. For example, if exports of the European Union to the US are levied MFN tariff rates and are not given any preferential nor any duty rate other than the MFN, the European Union would not appear in this list even if it is an exporter to the US market. Furthermore, an exporter can be granted different preferential and non-preferential tariff regimes by a certain reporter across years. By default downloaded data are sorted according to country name, year (in descending order, for applied tariffs) and HS-subheading. For applied non-MFN tariffs, aside from the same sort order previously described, data by tariff regimes are presented in the following order: free-trade area preferential duties; zone-zone preferential duties; other preferential duties; GSP duties; LDC duties, general duties (for non-WTO members usually); and other tariff regimes. Data in the sheet/file NonMFN_Only_Partners are sorted by reporter, year (also in descending order), partner (or exporter) name, and tariff regime, the order of which follows that for non-MFN tariffs. To sort downloaded data using a different sort sequence, select all cells in the Excel sheet including the last row of the header containing the column numbers (row 5) but excluding the rest of the header (rows 1-4) and choose Data -> Sort from the menu. The output file contains the subheadings in the original submission nomenclature corresponding to the subheadings in the nomenclature selected by the user. A concordance or correlation table named HS_Concordance is provided for all those subheadings where there are changes between the original nomenclature and the user-selected nomenclature. There is also an additional column on this table that shows the percentage of allocation among subheadings in the two nomenclatures. This information is very useful in calculating new subheading totals and new subheading averages in a different nomenclature. As mentioned earlier the list includes only subheadings where there are differences in scope and/or subheading code between the two concerned nomenclatures (see Nomenclature Selection and HS Concordance). As mentioned in Section A on Download Format, depending on the selection criteria the system outputs the data in one or more files/worksheets. The maximum number of observations (records or rows) allowed for each file is 65,000. (Note: EXCEL 2000 worksheet size limit is 65,536 rows). If the selection criteria yield an output dataset that has more than 65,000 observations the system will download only the first 65,000 records. The application is available in three languages. Selection can be done on the upper right corner of the screen.